Not a lot is known about the drugs trade in Mozambique, but the evidence suggests it is becoming a popular transit point for traffickers. Children playing on the beach in Vilanculos, Mozambique. Photograph by Rebecca Meeson-Frizelle. Looking out across the sea from the town of Vilanculos on the Mozambican coast, the silhouette of a large vessel, sitting on the edge of the blue-tinted horizon, is just about visible to the naked eye. 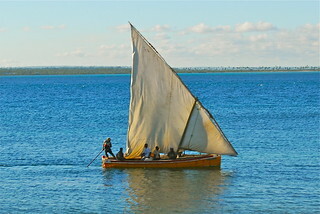 The group of local fisherman frantically hauling a net full of the morning’s catch into their modest dhows ignore it, but a splinter group of two or three of these small sailing boats set off towards it through the cobalt shaded waters. The likelihood is that it one of the many passing cargo or container ships has travelled across the vast Indian Ocean from Asia. Both the convoy of small fishing boats and their larger counterpart are here to do business, but not to exchange a few Malaysian bananas for some freshly caught crabs. The locals are expecting to acquire several kilograms of cocaine, which will be taken back to shore to be sold for recreational use in the town’s streets, bars, backpacking lodges and private residences. The drug is cheap, but potentially lethal. Strychnine, which is used in rat poison, is sometimes found mixed in with the cocaine. Drug use inevitably adds another dimension to the town’s social problems, which are usually defined in terms of poverty. But local consumption is largely a by-product − albeit an increasingly serious one − of a bigger issue, namely Mozambique’s growing role as a hub in the global drugs trade. Mozambique’s porous borders and long coastline, combined with its relative stability yet lack of governance in some areas, make it a useful transit point for drug trafficking networks. Understandably, little is known about the exact quantities of narcotics that make their way through the Southern African country. The fundamental lack of data on both drugs seized and drug-related arrests makes it difficult to assess the scale of the problem, but most agree that Mozambique’s problem pales in comparison to the notorious Guinea-Bissau. Compared to the unstable West African country, which many have described as a ‘narco-state‘, Mozambique is a “small player,” according to Joseph Hanlon, a Senior Lecturer in Development Policy and Practice at the Open University. “This is not big time,” he says, “nobody’s really interested. This is not Guinea-Bissau.” However, it is arguably partly because of the heavy international focus on Guinea-Bissau that alternative African transit hubs, such as Mozambique, have emerged. According to sources, there are five main types of drugs that enter and cross the country. Three of these − heroin, hashish and mandrax − are understood to be primarily trafficked by sea from the Pakistan, Afghanistan and India. These drugs often arrive in shipping containers hidden amongst legitimate goods. The narcotics are typically repackaged on shore and then smuggled overland to South Africa, the major regional market for illicit drugs, or via air to the US and Europe. Cocaine also sometimes comes in by sea, as witnessed on the shore at Vilanculos, but more typically arrives by air from Columbia and Brazil, smuggled in by drugs mules. As we can see from arrests and drug seizures at Maputo airport, these mules tend to be South African, Mozambican, Nigerian or Tanzanian. If the cocaine makes its way past security successfully, it either goes on to South Africa or continues its journey by air to Europe and East Asia. Finally, there is marijuana, which has a long history of local production and consumption in Mozambique. Use of the drug is engrained in much of Mozambican culture, and many of the country’s cannabis plantations are small, family-run operations, providing a crucial source of income. The majority of trafficking operations for marijuana are understood to be controlled by members of the local Pakistani communities who are generally based in the country’s northern provinces and are able to receive shipments of cannabis directly from Pakistan or other south Asian communities. As with Mozambique’s other drugs, evidence suggests the marijunana trade is also growing. In 2011, for example, 31.6 metric tons of the drug was seized by authorities, a 900% increase from the previous year. In the face of the government’s lack of drug-related data, much of the information available on Mozambique’s role in the global narcotics trade comes from reports of drug-related arrests. According to Charles Goredema, a Senior Research Consultant on Economic Crime in Africa, news of these interceptions may be promising sign. “They indicate that there is a substantial amount of resistance towards Mozambique becoming a drug trafficking hub,” he says. Typical homes and roads in neighborhoods of Vilankulos / Vilankulo, Mozambique. Note the firewood selling point in the foreground. Goredema also claims that Mozambique has been part of regional drug trafficking programmes led by international agencies such as Interpol, and that it has engaged in bilateral initiatives with the likes of South Africa. However, others suggest that Mozambican government’s efforts to curb its role as a transit hub may be compromised. One the one hand, authorities may simply lack the capacity and resources needed to effectively tackle the drugs trade, but on the other, there may even be a degree of complicity amongst some officials. In Africa and the War on Drugs, Neil Carrier and Gernot Klantschnig describe the extreme end of government collaboration in the drugs trade as one in which the state is “bought by powerful drug cartels, which gain official protection for their business or in even more extreme cases co-opt state actors into active positions within the trade.” There is little evidence to suggest the situation is such in Mozambique, but custom officials at borders, airports and ports and often reported to be involved in the trade or to accept bribes to turn a blind eye. Meanwhile there are also allegations of some senior government officials profiting from narcotics. According to Hanlon, figures in the Mozambican government may be linked with heroin in particular, allowing certain groups licence to trade in the drug and enjoying a cut of the profits in the process. Some observers also see the lack of high-level prosecutions related to drugs as further evidence of government inaction, if not complicity. Mohamed Bachir Suleman, for example, was added to the US government’s list of the world’s leading drug traffickers in 2010. The US claimed that “Suleman leads a well-financed narcotics trafficking and money laundering network in Mozambique” and prohibited American corporations from doing business with him. Mozambican authorities promised to investigate following the allegations, but to this day Suleman remains a free man. Some have pointed to the fact that the businessman, who is a bit of a local hero in Maputo, lives in a mansion down the road from the president and has donated millions over the years to the ruling party, Frelimo. Like with the other drugs traded in or via Mozambique, not a great deal is known about cocaine trade. It is notable, for example, that Paul Fauvet, Editor of the Mozambican News Agency (AIM), told Think Africa Press he was surprised to hear of cocaine entering the country via maritime routes, while some such as Hanlon were less so. What seems to be agreed on, however, is that Mozambique’s problem will continue to grow if steps are not taken by the international community and Mozambican government alike to learn more about the trafficking networks, address rising domestic drug use, and address corruption from the pettiest levels to the highest. Posted on 24th April 2014 by newsafrica. This entry was posted in Africa, Democracy, Economy, Mozambique, RENAMO, War on drugs and tagged Africa, Bazaruto Archipelago, Indian Ocean, Maputo, Mozambique, South Africa, Vilanculos, Vilankulo. Bookmark the permalink.